With due respect, when I received the invitation from Rico of this Awards Night, I entertained misgivings due to the absurdity of setting up budgetary allocations for the awards night when the greatest segment of the sales revenue of the Rex Book Store or Rex Group which is institutional sales has substantially dropped by Fourteen Percent(14%) which include government sales which dropped at Seven Eight Percent(78%) as consistently expressed in red numbers during the yearend business review presentation. Would this be a celebration of failureagain, I asked myself. The COO explained that instead of totally categorizing everybody as failures it would bein keeping with sound governance for remnants of those who did well like the Marketing and Tertiary Departments and RBSII to be given the honors and others in the institutional sales who did well. In short, to resuscitate the fallen military as they face greater battles. As unearthed during the yearend sessions or presentation or even in our private meeting, the probable reason why our biggest competitor has overtaken us is its propensity to monetarily entice better than usthe would-be clients which could only be neutralized or overwhelmed by strengthening our relationship. It was clarified by Professor Morato that ’trusted partner ‘ is manifested only through our frontliners – meaning those external persons who represent Rex like advisors and sales clerks and their ability to effectively serve as go between the clients’ wish and the ability of Rex as a Company to respond effectively to it. As mentioned by Boss Don, how could theybe relied upon if we are persistently failing to deliver on time. I believe this is critical and I have tried to inquire from Liza whether there is a chance for me to sit in. I have observed that when the season comes, we simply are not prepared to address long time problem. I truly get traumatized by the recurring scenario and I pray our blunderous mode of delivery would surgically be cured to put an end to this disdainful practice, destructive to the image of Rex. How could we be relied upon if there is no evidentiary proof of a good track record of new sales advisors though well-educated who have not been acquainted with our clients for a prolonged period of time or who have not been properly endorsed by long time successful advisors? I have mentioned time and again that relationship is not established overnight. one(1) school at Regina CarmeliMalolos through Sister Natalia a single book “Philippines and Her Neighbors” by Gregorio Zaide in a year’s time. Due to my economic desire to succeed, it gradually improved through persistence and patience and these same schools where I developed relationship like a relay was nurtured with greater fervor by Boss Don, but because of the vast responsibility of the COO, he delegated them to Cliff and now in the hands of Girl Malou although the height of the sales of these schools was reached when they were in the hands of Boss Don although I am optimistic Girl would be able to restore sales to where they were before. I also understand whereRollie is coming from. He was originally assigned to government sales where no sales werebeing realized until Chino recommended with my approval toallow him to promote to the private school, which due to his good looks then and now, coupled with built-in hunger and desire to succeed due to the prolonged drought in government sales he is where he is now. It is my observation that thesurvivors this year have been homegrown and have been with us for quite a time. I am referring to Ken Guerra and Breezy. Although I believe Roland Uy with the help of Cheer Morales who is comparatively new bounced back from being looked down as aloser. I understand also the predicament of assuming the role of an advisor. Advisor connotes the ability to gain respect where the words that would come out from the advisor would be respected as being authoritative. What I am trying to repeatedly convey is that relationship,attaining trusted partner status should not be left out and be allotted greater weight in the decision-making process with respect to evaluation and assignment of sales area. Allow me to convey on recent developments to further exemplify the meaning of a “trusted partner” to correlate it with “being different” as mentioned during the homily of Father Larry Faraon during the COO’s birthday and to consider the same for branding purposes. Instead of using pa-cute words in English, Liza used the vernacular in a Hitler-like voice as observed by Lucky Tan to set directions to the participants of the blindfold game to emerge as the first prize winner and for the totality of the games during the recent Sportfest and previous Sportfests. Although First Prize was awarded to Publishing under Sam during theChristmas cultural presentation, Liza’s group garnered second. I hope Liza could attack the delivery situation with the same winning style. Another example of a winner which projects in him a difference is the COO himself. My propensity for family members to speak publicly has its own advantage rinpala and should not be prohibited. Frankly, at times I would like to know the aspirations and inspirations of the celebrants and party participants during gatherings instead of talking sweet nothings, unfounded gossips and slanders which bring no meaningful input in the end. During the recent birthday celebration of Don, when one of her aunts was requested to speak about Don, she unveiled the noteworthy accomplishments of Don of uniting families – beit with the Buhain and Fontelera families and that of the Ignacio families, coupled with his predisposition to help people to be educated gratuitously. When I was called upon to speak, I mentioned about admiration of some executives that before a meeting would be held, Don would recite a prolonged Invocation seeking assistance from Divine Providence. When we went together to attend the blessing of De La Salle Library inLipa, we recited the rosary along theway where all the dead lolos and lolaswere mentioned. These manifestations on his part of doing the extraordinary deeds would immediately be categorized as a “trusted partner”which would redound to the benefit of Rex. It is indeed in compliance with the first(1st) family value of Love of God. It is my belief that we would be on the safe side if we would adhere to the family values laid down by the founders of the Rex Book Store as well as to adhere strictly to the business mission,vision and core values. Humility,promptness,dignity of labor, hopefully could be nurtured as traits of our front liners to justify to be called“trusted partner”. At times somebody would ask me“Bakitangaga mo sa party at hindi dramatic entrance?” In fact during the lifetime Mr. and Mrs.Fontelera they were being ridiculed as not possessing the traits of affluent business people as they were there before others would come. This person did not improve his economic situation until his death. On my part, kungminsanlangtalaganapakaagakosa airport nahindimagayani Boss Don. 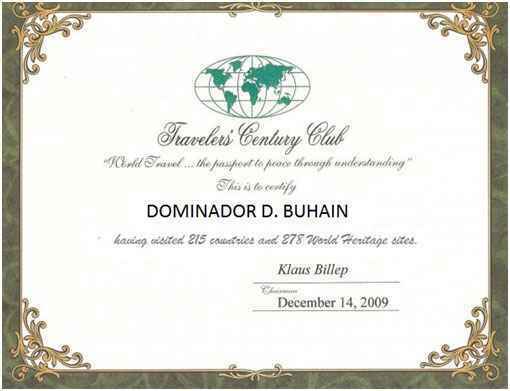 With this predisposition, God allowed me to visit 215 countries and 278 World Heritage sites. The same is true of the principal who ridiculed that I was a disgrace to the legal profession for promoting books. The fact that I am being invited this year as the Co-Chairman of Asean Law Conference as the President/Chairman of Rex Book Store would be something for his admiration. During the past we were not embarrassed to be carrying the heavy loads of sample copies which hopefully are being practiced until now. Bringing a single copy of an examination copy toTuguegaraofrom Manila though extremes are nevertheless examples of going the extra mile or of providing dignity of labor. The family values are replete with guideposts where we execute meritorious action which would give justification to be called “trusted partner” which connote excellence in services and quality of product lines. Mention has been repeatedly said this morning. that Department Order No.44 on the Moratorium of the purchase of the supplementary and reference materials has remained. I am, however, happy to inform you of the new developments where the recent communication of the New Book Suppliers Association of the Philippines (NBSAP) was received by the DepEd Secretary and that they were amenable already to the lifting provided certain conditions would be complied with. Aside from the conditions earlier presented, a single spokesman from an existing book publishers,book printers,book related associations would be appointed to discuss on the conditions for the lifting. The NBSAP due to the inaction of the two(2) other associations namely BDAP and presumptively PEPA which were the earlier spokespersons sought the assistance of the Philbook which is an umbrella organization organized in 1996 under Pres. Buhain during the incumbency of Pres. Buhain as NBDB Chairman. Although there were hesistancy on the part of BDAP and PEPA at least eight(8) book publishers’ association out of the ten(10) associations voted in favor of Philbook to communicate with DepEd. An Executive Committee comprising five including Pres. Buhain, Ms/.Sonia Santiago,Ms. Florinia Espiritu Santo,Ms. Bing De Jesus appointed Mr. Toots Policarpio as the single spokesman. I am therefore happy to inform you there appears a glimmering light at the end of the tunnel for the lifting of the moratorium under the leadership of your humble representation. Thank you.Happy 65th year for Rex.